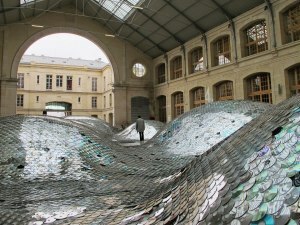 “Waste Landscape” is an artificial undulating landscape covered by an armor of more then 60 000 unsold or collected CDs, which have been sorted and hand-sewn. It is well known that CDs are condemned to gradually disappear from our daily life, and to later participate in the construction of immense open-air, floating or buried toxic waste reception centers. Made of petroleum, this reflecting slick of CDs forms a still sea of metallic dunes: the monumental scale of the art work reveals the precious aspect of a small daily object. The project joins a global, innovative and committed approach, from its means of production until the end of its “life” .Over the course of multiple exhibitions, ‘Waste Landscape’ will go through quite a few transformations before being entirely recycled into polycarbonate. Waste Landscape is part of Rokolectiv Festival and is presented in collaboration with TodaysArt Festival (The Hague). "Waste Landscape - Elise Morin & Clémence Eliard" Art Show in Bucharest. You can get here description, reviews, address, time and details of "Waste Landscape - Elise Morin & Clémence Eliard" Art Show in Bucharest. Visit Bucharest Tips for more Art Show events in Bucharest!